Please be aware that our bakery isn’t a diary free environment and we bake with dairy products and eggs every day. All of our vegan cupcakes are baked without any dairy or animal products but are baked in the same environment where these products are used and therefore we cannot guarantee that they won’t contain traces of any of the above. 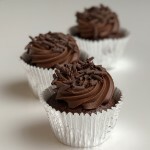 Decadent chocolate cupcake topped with a chocolate frosting and finished with dark chocolate curls. 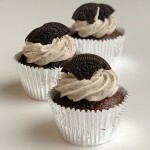 Rich chocolate cupcake baked with Oreo cookie pieces topped with Oreo cookie frosting and finished with Oreo cookie pieces. 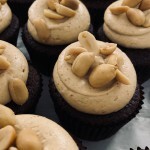 Sweet chocolate cupcake topped with a peanut butter frosting and finished with lightly salted peanuts. 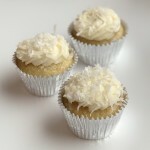 Light and moist lemon cupcake baked with shredded coconut, topped with creamy coconut frosting and finished with shredded coconut. Somewhat of a tropical vibe! 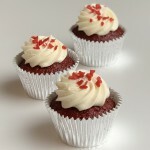 Indulge in the ultimate red velvet cupcake with just the right hint of Callebaut cocoa topped with creamy Madagascar Bourbon vanilla frosting and finished with red confetti hearts. 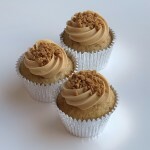 Cinnamon and Speculoos (Biscoff cookie) cupcake topped with Speculoos (cookie butter) frosting and finished with Speculoos cookie crumbles. 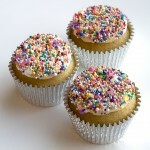 Light lemon cupcake topped with a vanilla frosting and dipped in vegan rainbow sprinkles. Sure to bring a smile to your face!